This adds a simple one track 7 level dentist career. I made this back in October and shared it with a few people in a simmer group until someone stole it and claimed it was their own. You are not allowed to translate without my permission, if you want to add a translation please message me and I will be more than happy to add it to the mod. You are not allowed to edit this and re-upload, you are allowed to edit it ONLY for personal use, no uploading to paid sites and no adding adfly links to my careers. This career comes in English, Japanese, Polish, Spanish, Portuguese,and French so if you use any other language it will pop up in English. Thank you so much Sen_ss for the Japanese translation, Pawlq for the Polish translation, sofi2401 for the Spanish translation, ivansumida for the Portuguese translation Tynah for the French translation. 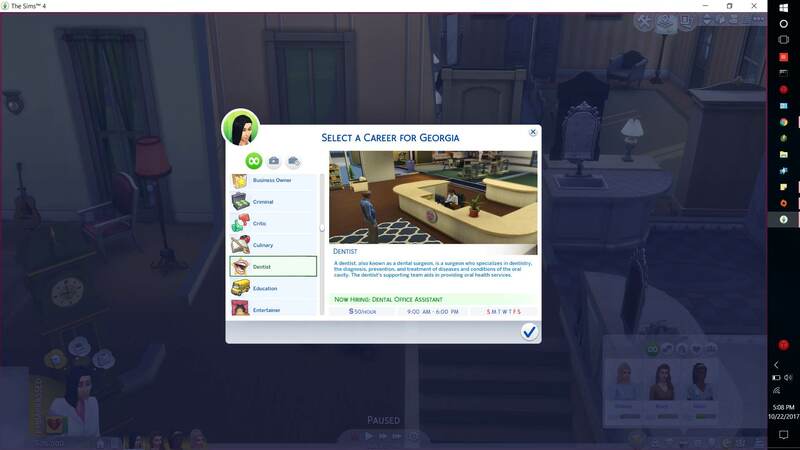 The Dentist career starts off on the higher end at 50 simoleans an hour and ends at 750 simoleans an hour.